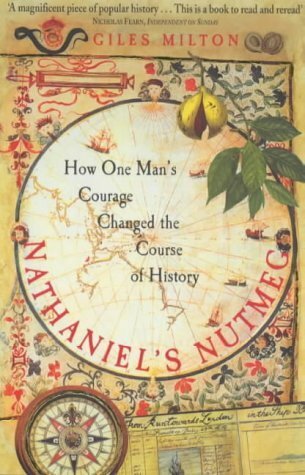 At this stage I consider myself something of a connoisseuse of popular history books concerning ships and the sea, and Giles Milton's Nathaniel's Nutmeg is right up there with In the Heart of the Sea as one of the best. Telling the story of the spice trade from the British point of view, Milton has great anecdotes about the beginnings of the wars between Britain and the Netherlands, the formation of both the British and Dutch East India Companies, the reasons for the high value of spices, and some lovely stories about the lives of the people who explored, fought over, and traded with the natives on these remote and hostile islands. And yes, these books do follow a pattern, as the LRB says. They invite you to imagine a world without the thing the book is about, in order to build up its importance and make you believe that the main subject of the book (invariably some person of great character who has been consigned to the fringes of history in a way that makes you wonder about the fate of Neil Armstrong (especially given that there are already twenty year-olds who don't know who he is)) is a greater historical figure than Nelson or Magellan. Which of course they aren't, unless you're a chemist or a cartographer or lexicographer or whatever kind of specialist the author is. The most interesting thing about this book, though, is that it starts off being about one thing and ends up being about something else entirely. And for once - hats off to Sceptre for this - the blurb on the back doesn't give away the whole point of the book, so there is actually a nice surprise at the end. Top notch.